Belinda Johnson CPA PA, minority woman-owned audit and accounting firm is registered in the state as a NC HUB Vendor, meets all requirements imposed by state, federal, and local laws including rules and regulations governing the operation of a certified public accounting firm. The Firm and all assigned key professional staff are properly licensed to practice in North Carolina. For many years, the Firm has served in the North Carolina community. Before this conflict, neither the Firm or its managing partner had received violations or actions by the Board of CPA Examiners. This was a long 5-year struggle. 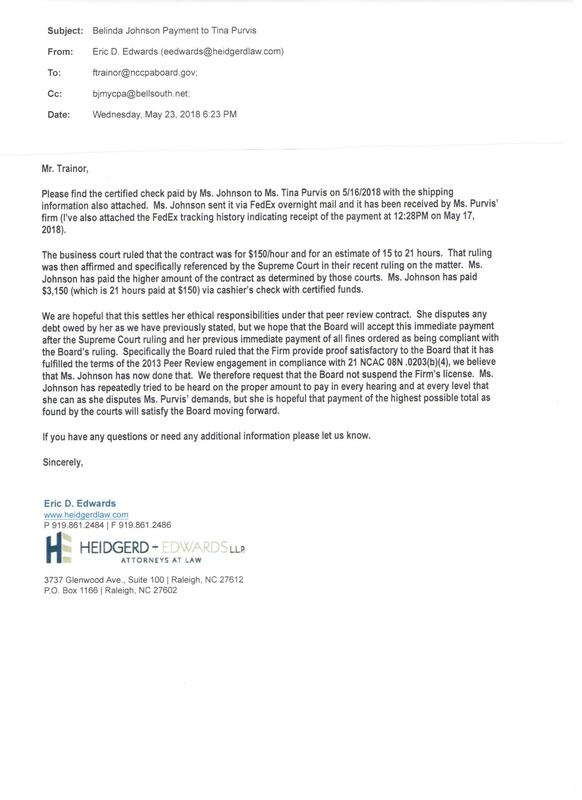 In summary, this matter began as a dispute between the Firm and Tina Purvis concerning a 2013 Peer Review and a billing dispute. When the Firm appealed through the CPA Board to address the issues, no credence or regards were given to any of the Firm's concerns or supporting documents. The Firm made a strategic mistake in initiating the appeals process without legal representation. It was a mistake in thinking that this situation was a matter of simple presentation of the facts. Because of the Firm's lack of legal expertise, procedural mistakes were made which could not be addressed by State Courts. In an effort to be an open book, the Attorney letter, Board Response and the NC Board of CPA Examiners Hearing transcript are posted below for your review. Copyright © 2018 Belinda Johnson CPA PA - All Rights Reserved.